ONE of Helensburgh's most famous residents for almost 20 years had the unusual distinction of being both a sea captain and a successful novelist. Captain (later Sir) David William Bone, Kt., C.B.E., LL.D., lived from 1915-34 at Underwood, 9 Lower Sutherland Crescent, and had an astonishing and varied career. He is even credited in the Oxford Book of Quotations with writing in his 1910 novel ‘The Brassbounder' a phrase, part of which has become immortal: "It's ‘Damn you, Jack — I'm all right!' with you chaps." Born in Partick in 1874, one of six sons of David Drummond Bone, publisher of the North British Daily Mail of Glasgow, he was educated at Partick Academy and went to sea at the age of 15 as an apprentice on the square-rigged City Line sailing ship City of Florence. His apprenticeship in sail formed the basis of 'The Brassbounder'. For the next seven years he served as a sailor in the Merchant Navy working on windjammers bound for Australia. In 1899 he joined the well-known Anchor Line, and served on a troop ship during the Boer War. Already a master mariner, he married Glasgow girl Mary Helen Bell Cameron in the city on June 11 1902, and on February 4 1905 their daughter Winifred Helen — known as Freda — was born. They also had a son David, later Lieutenant Commander David D.Bone, D.S.C., R.N. 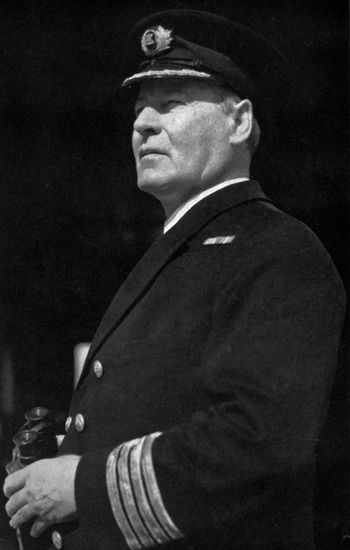 After being captain of several ships, including transatlantic liners, he rose to become Commodore of the Anchor fleet. He is particularly associated with the 575 feet long 17,000 ton liner Transylvania which he commanded twice. It was reported in an American rotary publication that "as commander of the Transylvania his genial disposition and adaptability make him a decidedly interesting character." He was the captain of the 11,000 ton Anchor Line transport ship Cameronia, which previously had several brushes with U-boats and with 3,000 men and 250 officers on board, when she was torpedoed by an enemy submarine in the Eastern Mediterranean on April 15 1917, with the loss of 140 lives. The submarine was not spotted by the crew of the converted liner, and the disaster happened in the afternoon on a calm sea. Half an hour after the severe explosion which caused the deaths, the ship sank. But most of the men were on board lifeboats and some had been taken on board destroyers. The last man to leave the ship, of course, was Captain Bone. When his officers reported "All clear" and left the ship, the captain jumped from the bridge and caught the stay of the wireless on a destroyer alongside — a gymnastic feat. Afterwards it was reported that his fine seamanship was a big factor in saving the great majority of the men on board, although the cool courage of his officers and crew and the discipline of the troops were equally important. He took the Circassia in with assault troops to every Mediterranean landing and thought that going inshore at night and getting away before the bad bombing started was "safer than people imagine. The fellows we left ashore had the dirty end of it." He ended with the bloodless landing in Malaya — Operation Zipper. His son, Lieutenant Commander David Bone RN, was senior beachmaster there. They met four times. When the tank landing craft beached the doors could not be opened because the jungle grew to the water's edge, Commandoes had to leap ashore and cut down trees. David Jnr. reported to his father: "Only opposition from rightful inhabitants. Heavy cocoanut fire. Monkeys rained them on our men's tin hats until the palms were cut under them." He was commissioned to write 'Merchantmen-at-Arms', the semi-official account of the Merchant Service during World War One, and this was illustrated by his artist brother, Muirhead Bone. He commanded ships in convoys in both the First and Second World Wars — 1939 was his 50th year with the Merchant Service — and when he received the CBE from King George VI at Buckingham Palace in 1943 for his wartime services, the King asked how many convoys he had sailed in. "I had to tell him that I don't really know the exact number," he told a reporter afterwards. "I have been sailing in convoys since the beginning of the war, and I was sailing in them all through the last war too." In addition to convoy duties, he was involved in troop carrying, commanding landing ships in North Africa, Sicily, Anzio and St Tropez, and the repatriation of Australian solders who had been prisoners of war in Shanghai to their homeland and Russian ex-prisoners home to Odessa. He retired from the sea in 1946 and was able to spend more time writing and broadcasting, as well as on the golf course where he was a very good player. Earlier, in 1937, he had received the Coronation Medal from King George in recognition of his long association with the Merchant Navy. By then he was already better known to many as an author than a seaman. His first published work was in 1901 when, with Archibald H.Charteris and under the collective pseudonym of James Hamilton Muir, he wrote ‘Glasgow in 1901', an enthusiastic and factual description of the city which was illustrated by his younger brother, the artist Muirhead Bone. His first novel was a fine sea tale, ‘The Brassbounder', published in 1910, which became a classic of the square sail era. Then came ‘Broken Stowage' in 1915, a collection of shorter sea sketches. In 1919 he collaborated again with his brother who lovingly illustrated ‘Merchantmen at Arms', a moving account of the merchant marine during World War One. Next came ‘The Lookoutman' in 1923 — and these works brought him to public attention and he became a well-known authority on maritime matters. His later books included ‘Capstan Bars' in 1931, ‘Merchantmen Rearmed' in 1949, and ‘The Queerfella' in 1952. One critic wrote: "In the long roll of great writers who have reflected the simplicity and severity of sea life, Captain Bone will take a permanent and honourable place." He confessed that at one time he thought of giving up his calling and devoting himself to writing — and he would have done so but for his friend, the famous Polish-born novelist and short story writer Joseph Conrad, who was also a master mariner. "Conrad's greatest regret was that he had given up his first mistress," Captain Bone said, "and on his advice I decided to remain at sea and make my cabin my writing-room." He first corresponded with Conrad in 1910, but only met him in December 1919 in Liverpool when they both spoke at a University Club dinner to honour the Merchant Service. Four years later he was in command of the Tuscania when Conrad was a passenger on the transatlantic crossing. In his book ‘Helensburgh and the Three Lochs' published by Macneur & Bryden Ltd. in 1957, J.Arnold Fleming commented on Captain Bone's admiration for Conrad which was shared by another burgh writer and author, Neil Munro. 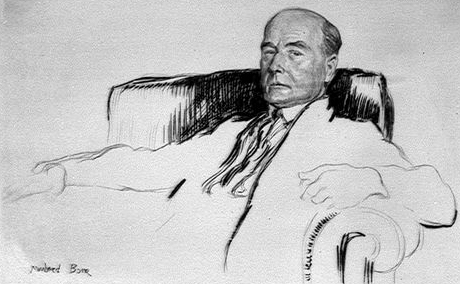 He wrote: "If Conrad ever visited this town, which is probable, he would be a welcome guest, for I am aware of their cordial intimacy in the Art Club in Glasgow, of which I am an old member." The Captain, whose great grandfather was a boyhood companion of Robert Burns, was knighted in 1946 and his autobiography, ‘Landfall at Sunset', appeared in 1955, four years before his death on May 17 1959. His artist daughter Freda, who spent most of her childhood in the burgh, left Underwood on November 4 1932 for her wedding in Glasgow's St Mary's Cathedral. She married Glasgow man John Sprott, a clerk in holy orders and son of a master mariner, and the Episcopal Bishop of Glasgow and Galloway, J.Russell Darbyshire, officiated. She died in Morningside, Edinburgh, in 1991 at the age of 86. His brother Muirhead, who was two years younger, trained as an architect but worked as an etcher and watercolour artist. In 1916 he was the first person to be appointed an official war artist — a role he also fulfilled in World War Two. He was knighted in 1937 and died in 1953. Their older brother, James, born in 1872, kept up the family tradition of journalism and was London correspondent of the Manchester Guardian for 40 years until 1945. He died in 1962. The main picture was taken by Carl Mydans for Life Magazine; above is a sketch of Captain Bone by his brother Sir Muirhead Bone.